Buffalo grass lawns need less water, fertilizer and mowing than Kentucky bluegrass lawns. Buffalo grass turf goes dormant and turns brown with extended drought and cool fall weather. 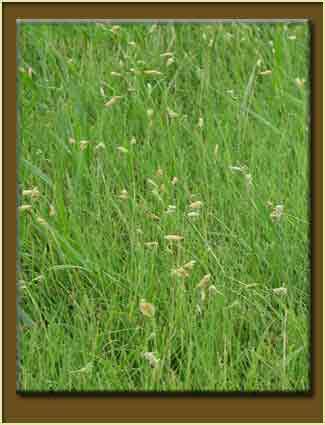 Lawns of buffalo grass, although usually started from seed, may be vegetatively planted. Good soil and close attention to new seedlings can help get a good stand started quickly. Proper care will help keep buffalo grass lawns attractive through the year. Buffalo grass (Buchloe dactyloides) is a permanent, native, low growing, warm season grayish-green grass. It is an important range and lawn grass in eastern Colorado. This sod-former produces vigorous runners or stolons. In the High Plains, this grass often is found growing as a companion with another native, blue grama. Buffalo grass can sometimes serve quite satisfactorily as a lawn grass. Before choosing this grass for a lawn, its advantages and disadvantages should be considered. There are several advantages of using buffalo grass for lawns. It has good drought tolerance and stands up well to wear. Irrigation, if carefully done, can be beneficial in establishing stands and in keeping an attractive and serviceable turf. Improperly done, watering can cause the buffalo grass to be overrun by other grasses and broadleaf weeds. This low growing grass requires little mowing to give it a uniform appearance. Buffalo grass has a low fertility requirement, and it often will maintain good density without supplemental fertilization. The fact that buffalo grass is a warm-season grass should not be overlooked. It turns brown with fall's first freezing weather. It greens up with the return of warm weather in the spring. Consequently, it can be brown and unattractive when Kentucky bluegrass and other cool-season lawn grasses look best. Buffalo grass, without supplemental water, will go brown and become dormant during extended summer drought periods. This grass has poor shade tolerance, and it does not do well above 6,000 - 6,500 feet (1828 - 1980 meter) elevations. Because of rather aggressive runners, buffalo grass can require edging along walks, driveways, and shrub and flower beds. This grass has both male plants with flowers 5 - 20 inches (13 - 51 centimeters) and female plants with burs containing 2 to 4 seeds near the soil. Variability in turf may result from differences in appearance of the male and female plants, growth height, color and density from one plant to another. Those who are accustomed to a Kentucky bluegrass turf may object to walking (particularly barefoot), playing and sitting on buffalo grass turf. Buffalo grass will grow on heavy and compacted soils. However, it is easier to start and keep on good loam soils. When possible, if any construction is to be done, the topsoil should be saved and returned to the lawn area after construction is completed. Heavy soils may be improved by applying a layer of good quality organic matter (peat moss, aged manure or compost) to a depth of 1 - 2 inches (2.5 - 5 cm) over the surface. This should be done before final tilling and seed preparation. Buffalo grass does not have good salt tolerance. If salt problems are common in the area, a soil test can determine potential success of a buffalo grass planting. Before planting, the soil and soil amendments should be worked well to a depth of 4 - 6 inches (10 - 15 cm). After the final tilling, the soil should be leveled and firmed. Areas that have trenched for utility lines should be soaked and filled until they are level with the surrounding surface. Buffalo grass lawns usually are started from seed. There are cultivars on the market, such as "Cody", which have been selected for good green color and thick turf. The best time to seed buffalo grass lawns is May and June. At that time of year, with a good watering every day, buffalo grass seedlings begin to appear 6 - 10 days after planting. During warmer parts of the year, runners develop and spread is rapid. Seedings made in August or later germinate slowly and grow little before cold weather. Suggested seeding rates differ greatly. They range from as little as 1 pound up to 10 pounds per 1,000 square feet (0.45 to 4.5 kilograms per 90 m). Five pounds (2.3 kg) of a good quality, treated seed appears to be adequate for broadcast seeding for most situations. Buffalo grass seed is treated to improve germination, not to protect the seed against disease. The more seed used the more rapid the ground is covered. Broadcast seeding followed by raking in the seed is a common practice, but the burs tend to stay on the surface. A more practical approach, using less seed, may be to plant the seed in shallow furrows, spaced 6 - 8 inches (15 - 20 cm) apart and cover it with 1/2 - 2/3 inches (1.3 - 1.7 cm) of soil. A starter fertilization usually will show little benefit on a good topsoil but can be beneficial on poor soils. An application of 5 pounds per 1,000 square feet (2 kg per 90 m) of diamminium phosphate (18-46-0) or a commercial lawn starter fertilizer used at the rate recommended on the bag can be used on poor soils. For best results, a new seeding should be watered to keep the soil moist. Two weeks after seed germination, watering intervals can be lengthened to every 2 to 3 days. Without supplemental watering of buffalo grass, it often takes from 5 to 10 years to get a good ground cover. Buffalo grass may be started by transplanting a 4-inch (10 cm) or larger sod piece. These plugs should be taken to a depth of 2 to 3 inches (5 - 8 cm). Plugs that are transplanted in the spring from 12 to 24 inches (30.5 - 61 cm) apart - with watering and weed control - can sometimes cover the ground in one season. Buffalo grass sod is seldom laid as a solid cover. The scarcity of sod for home lawn use and the need to cut the sod at least 2 inches (5 cm) deep are problems with sodding. Buffalo grass that is vegetatively transplanted needs to be well watered for several weeks. Since buffalo grass is normally planted in the spring, new-stand weed competition can be serious. Hand-weeding and frequent mowing at 1 1/2 - 2 inches (4 - 5 cm) can help to keep the weeds controlled, and encourage faster buffalo grass coverage. Once established, buffalo grass usually will persist without irrigation in eastern Colorado. To keep a better looking turf, and one that will provide a better surface for general use, deep watering every two weeks or so during summer dry spells can be helpful. The soil should be soaked 6 to 8 inches (15 0 20 cm) deep. In especially dry springs, a good watering about the time the buffalo grass is beginning to green can help get the grass off to a good start. Low growing buffalo grass needs only infrequent mowing. Left unmowed it will get to a height of 4 to 5 inches (10 -18 cm). But, to keep the male flowers down and to get a uniform appearance, mow with a sharp blade, at a height of about one inch (2.5 cm). This will help improve the appearance of the turf. The buffalo grass should be mowed to reduce the height of the grass by no more than 1/3 to 1/2 of its total height. That is, when the turf gets to 1 1/2 to 2 inches (4 - 5 cm) it should be cut back to one inch (2.5 cm). In late spring, mowing may need to be done every two weeks. Later in the season mowing every 3 to 4 weeks probably will be adequate. Broadleaf weeds, such as bindweed and dandelions, can be quite objectionable in low growing buffalo grass. This is especially true in dormant, brown buffalo grass turf. Used according to recommendations on the label, 2,4-D can effectively control most of the weed problems in buffalo grass turf. Cool season grasses, such as bluegrass, tall fescue, and quackgrass, can give quite an objectionable blotchy appearance, especially in dormant buffalo grass turf. A uniform-appearing dormant buffalo grass lawn may not be objectionable; whereas, one pockmarked with green may be. A green turf colorant can be used to offset this color difference. Chemicals such as glyphosate (Roundup and Kleen-up) can be used to spot kill objectionable grasses. Remember that herbicides used to kill grass can also kill the buffalo grass once it is green and growing, so treat weedy grasses early while the buffalo grass is dormant. Always read and follow directions on herbicide labels. Adapted fromColorado State University Extension Service, bulletin no. 7224.